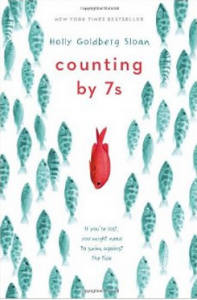 Counting by 7’s, a New York Times Bestseller by Holly Goldberg Sloan, is an inspiring story of a young adopted girl named Willow Chance. She is very different from the average teenager. Categorically, she is a genius. She is the kind of girl that is interested in everything she sees. But some things, like plants and medical conditions, interest her more than her peers.” Willow lives the life that any girl would want, until something utterly tragic happens. It is completely unthinkable and she wishes that she could be able to travel back in time and stop someone, to prevent a tragedy before it’s too late. Ever since Willow was adopted she had relied on her new parents to become the only child that looks up to them as any child would, but Willow starts to question “Is it possible to be loved too much?” Her thoughts on this are completely questionable, however they are in a considerably favorable way that no one could think of except for her. The story is set in Haegan Oaks where Willow and her adopted parents live their lives free as anyone could ever be.This book completely and utterly mesmerized me as each chapter flowed on so perfectly that every time I would hear the number 7, Willows favorite number, I couldn’t wait until the end of the day when it was time for me to continue reading this page turner.